Good afternoon, good to see you. I wish to welcome those also who are watching on web TV and I would like to express my gratitude to Medija Centar for hosting us. The introduction to my lecture is going to be rather long because the younger generation watching this lecture need an update on this matter. Our logo here reflects the fact that there is no time to loose when it comes to finding the missing people. It shouldn’t be me standing here doing this lecture, it should be the Serbian schoolteachers or university professors. I’m doing this solely because no one else in the educational system is telling you the truth about some parts of your contemporary history in Kosovo that is crucial for understanding the current situation. Having said that let me also emphasize that the schoolteachers and professors at the universities cannot be blamed for this, the responsibility for this situation lies solely with the authorities and the Ministry of Education since they are the ones who set up the curriculum for schools and universities. I’m Norwegian as you can see from the flag at the front. I am 77 years old and instead of enjoying my retirement I am standing here before you. I myself have been educated in the Army where I served for 17 years. I was 37 when I left the Army in 1978 holding the rank of major. The next 6 years I worked as operational manager for a company dealing with graphics, paper production and office supplies. In 1984 I became an independent consultant within logistics serving the Church Educational Centre / Institute for Christian Upbringing (IKO) and different private banks. In 1989 I was hired by the Central Bank of Norway as Assistant Head of Division and served there for 9 years and at age 57 I qualified for an early retirement scheme in March 1998. The missing details of Serbia’s contemporary history. The new documentary THE UNIDENTIFIED by BIRN (Balkan Investigative Reporting Network). Before we deal with the topics for today let us look at some background information. 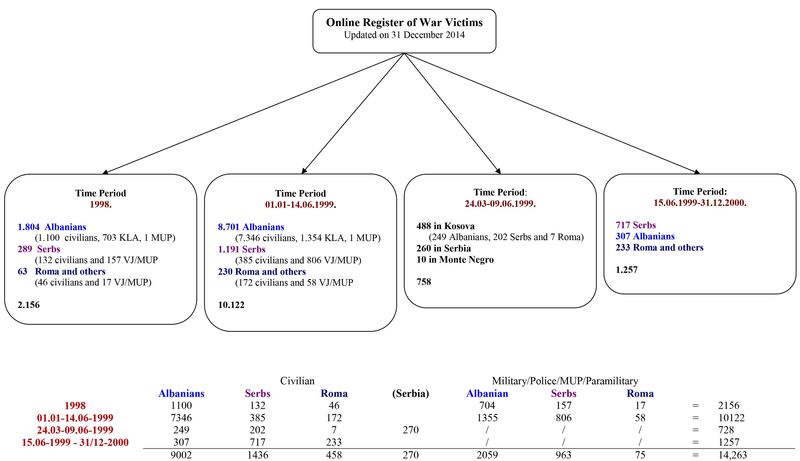 The figure is from Humanitarian Law Centre’s documentation and shows the total number of people killed in Kosovo 1998-2000. The chart is divided into a top and a bottom part. 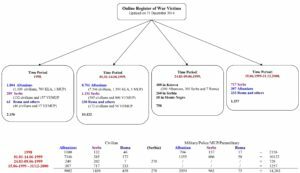 The top shows four time periods and the bottom demonstrates total number of people killed divided into ethnic groups and civilians, military personnel, police and MUP or paramilitary groups. The numbers at the bottom display my calculations. Of a total of 14,263 killed in Kosovo there are 1,669 bodies that haven’t been found, of these 400 Serbians and 1,269 Albanians. Details around these numbers can be found in the Kosovo Memory Book published by the Humanitarian Law Centre and my two documentary books and a film I produced concerning these issues. My last lecture in 2016 contains a comparison of the number of those killed found in the Kosovo Memory Book during the conflict and the numbers in my documentation. According to my research the number is 10,600, consisting of only civilians. After observing the results of the Milošević regime attacking the Albanian population from January 1998 to June 1999, it was my arduous task to document the scale of destruction in terms of civilian victims and casualties. Normally, a conflict has at least two sides but the Kosovo conflict went from being a two-sided conflict of interest to a one-sided one, where carefully planned crimes against humanity were executed by the Milošević regime towards an unarmed Albanian population and thus triggered an international reaction. The UNMIK and the UN in New York had done nothing to document that story neither did the former Yugoslavia under President Vojislav Kostunica who initiated “Commission of Truth and Reconciliation Yugoslavia 2001-2004. As far as it is known the Commission never conducted any interviews, held any hearings or filed any reports. 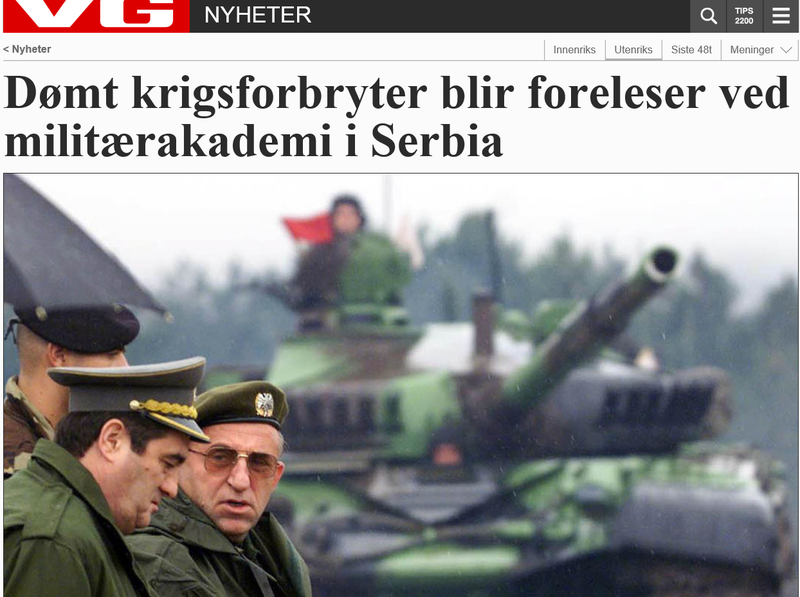 It says the commission had plan fully cooperate with ICTY (Internatiobal Crime Tribunal for the former Yugoslavia). In my opinion, nothing can justify the slaughter of 10,600 unarmed civilians: children, women and men over a period of 18 months and the expulsion of two thirds of the Albanian population from Kosovo. My hope is that this lecture over time will result in locating the whereabouts of the still missing victims of the war, so that the thousands of family members finally can find rest and have a grave to visit. I also hope that this lecture can reach the younger generation, since in my opinion they have been deprived of their right to know everything about their country’s contemporary history, especially the period of 1998-99 in Kosovo. If you don’t know the full truth about any particular issue in life then you will have problems drawing the appropriate conclusion. Some of you will eventually become politicians in leading positions or prominent businessmen, so knowing the full truth about your contemporary history is going to help you make the right decisions later on. I have already given lectures here twice when I talked about matters relating to Kosovo and Serbia. The first time, in 2015, was about what happened in Kosovo in 1998/99 and my documentation about war crimes committed there. The second time, in 2016, I looked into how to proceed from there, finding a way where reconciliation and forgiveness can develop and grow between Serbia and Kosovo. I think that the younger generations both in Kosovo and Serbia today have a unique chance to impact their societies in a profound way by personal engagement. The youth today possesses a flow of information from different sources, which they can digest individually and make up their mind about certain matters. Only twenty years ago this flow of information was not available and one had to rely on others in all matters in life, including politics. The people in the Balkans in the former republics of Yugoslavia used to work together without major problems both before and after World War II and they did well compared with the rest of Europe. For this reason Yugoslavia was a respected country. Up to the 1990s Yugoslav citizens travelled without restrictions on their passports, and people could choose where to live and work inland or abroad. After Tito’s death in 1981 the political attitudes among leading politicians in Yugoslavia changed dramatically which ultimately led to the breakdown of Yugoslavia. Today the younger generation in the Balkans has to find its way back to these special skills in politics where differences between countries or people can be solved by negotiations and mutual compromises. If the younger generation can rediscover these unique skills in politics, the area of the former Yugoslavia will prosper again. I think there will be no problem too difficult among the ethnic groups that couldn’t be solved by cooperation and finding the middle ground. In July 1999 I was hired by the United Nations High Commissioner for Refugees (UNHCR) and the Norwegian Church Aid (NCA) to coordinate an emergency program called “Removal of human bodies from wells” in Kosovo. The program lasted for 8 months and 127 Albanians were found in wells and rivers. Part of my job was to have these victims identified, registered and buried. At the time I did not know that this would later lead to the discovery of 400 mass graves containing the bodies of 10,600 civilian Albanian women, children and men. 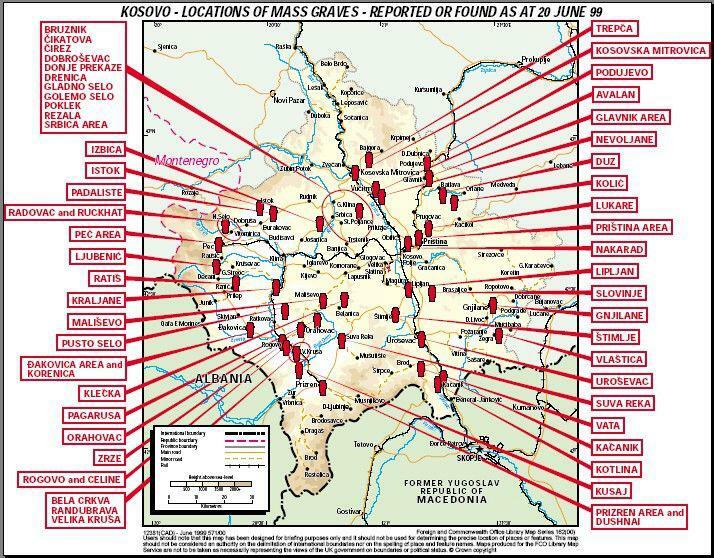 This map was created by the British Kosovo Peacekeeping Forces (KFOR) as early as 20 June 1999. The Serbian military, police and civilian authorities left Kosovo around the 11th of June as part of an agreement that had been signed by the Serbian military and KFOR. What was actually happening from early 1998 until June 1999 is going to surprise you beyond your imagination. Milošević’s regime backed by Yugoslavian military units, Serbian police and civil militia started a rampage as early as January 1998 and it lasted until the beginning of June 1999. Albanian civilians over most parts of Kosovo were randomly picked and killed; at least it looked like that at the beginning. But as months passed by planned state terror actions took form and Albanian citizens were forced to leave their homes in the villages because of military artillery shelling. Added to this, the military, police and civil militia or paramilitary forced the fleeing population alongside the roads southward and out of Kosovo. Scenarios like this were described by witnesses in the court proceedings at The International Crime Tribunal for Yugoslavia in the Hague and became a major part of the indictment against Milošević’s reign in Kosovo. When I came to Belgrade for the first time in 2013 and started to talk with people, I met young people and students who didn’t know much about the events in Kosovo 1998-99. Conveniently, they were told by the Milošević regime that the Albanians created problems in Kosovo and therefore it was necessary to take care of the troublemakers using military action. Consequently the people I talked to they didn’t know the reason behind the NATO airstrikes that started on the 24th of March 1999 and were aimed at specific targets in Kosovo, Serbia and Montenegro. They were told a story by the Milošević regime that had no connection whatsoever with reality. I realized that my main job in Belgrade had to be informing the public about what really happened in Kosovo and bringing up the issue of reconciliation and forgiveness. In order to achieve progress in the process of reconciliation, however, most of the still missing 1,669 people (400 Serbians and 1,269 Albanians) have to be found. I took on the job of documenting the 400 mass graves and 10,600 victims back in 2006; it was a voluntary move on my side. The UNMIK and the UN in New York up until the summer of 2006 had not taken any actions to secure and compile documentation available from the UNMIK itself, international NGOs or others collecting ID-data of missing people, interviews of survivors, family members and neighbors regarding massacres committed during 1998/99. I had visited the Kosovo Institute of History and Archive of Kosovo before I started documenting the 400 mass graves reported by ICTY to the UN Security Council in November 1999, and asked them what they had done or were planning to do and their answer surprised me. The two directors told me that at the time – more than six years after the war – they still had no resources to conduct a research and were basically told not to do anything about the matter. They urged me to start documenting as soon as possible, before information and data vanished or crucial witnesses died. They even wrote a recommendation for my project. They said no one could stop me since I was a foreigner. Therefore, I took on that very special job. www.truth-commission.com and download it for free. The gift you will receive after the lecture will also contain our card with details. 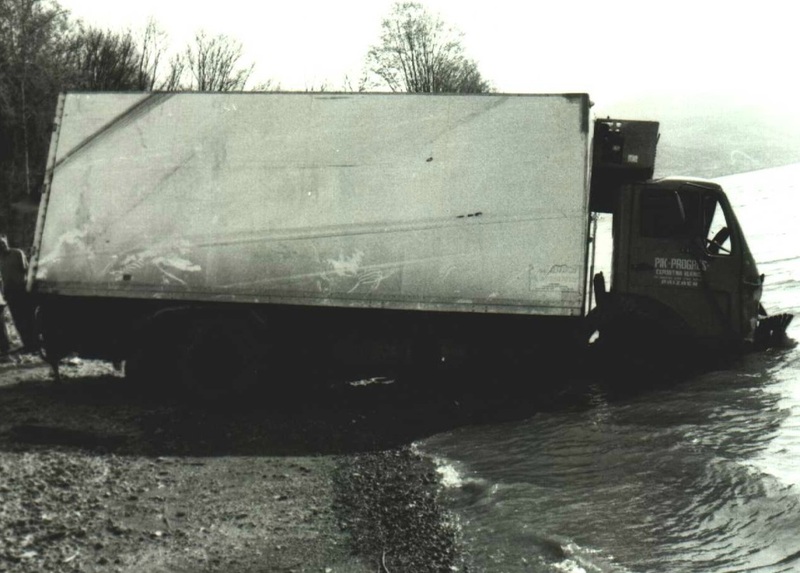 The event that first disclosed the whole operation of transporting dead Albanian civilians from mass graves in Kosovo into several new hidden mass graves in Serbia occurred close to Batajnica not far from Belgrade when a truck full of dead people drove into the Danube river. Local police found dead Albanians in the truck on the 7th of April 1999. These following high-ranking politicians and military leaders were found guilty of planning, aiding and abetting so that 10,600 Albanian civilian children, women and men had to suffer a terrible death. Former Yugoslav Deputy Prime Minister Nikola Šainović, Yugoslav Army (VJ), General Nebojša Pavković and Serbian police General Sreten Lukić who were each sentenced to 22 years of imprisonment for crimes against humanity and violation of the laws or customs of war. Yugoslav Army General, Vladimir Lazarević and Chief of the General Staff, Dragoljub Ojdanić were found guilty of aiding and abetting a number of charges of deportation and forcible transfer of the ethnic Albanian population of Kosovo and each were sentenced to 15 years’ imprisonment. The Prosecution charged these five with crimes committed during a campaign of terror and violence directed against the ethnic Albanian population of Kosovo in early 1999. Each one of the accused alleged to have participated in a joint criminal enterprise, the purpose of which was to modify the ethnic balance of Kosovo to ensure continued control by the Serbian authorities. The plan was to be executed by criminal means, including deportations, murders, forcible transfers and persecutions of Kosovo Albanians. Yugoslavia’ former General-in-Chief of Staff Nebojša Pavković (left.) and chief of staff Vladimir Lazarević (right.) The photograph was taken on 1. September 2000. Both were convicted to long sentences by the war crimes tribunal in The Hague. The newspaper article tells about a massive and logistically complex operation. 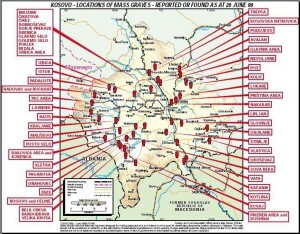 After the war, thousands of dead Albanians were found in four separate mass graves, hundreds of kilometers from Kosovo. General Lazarević (68 years old at the moment) was granted early release in 2015 after serving two thirds of his 15-year sentence in prison for war crimes against humanity. 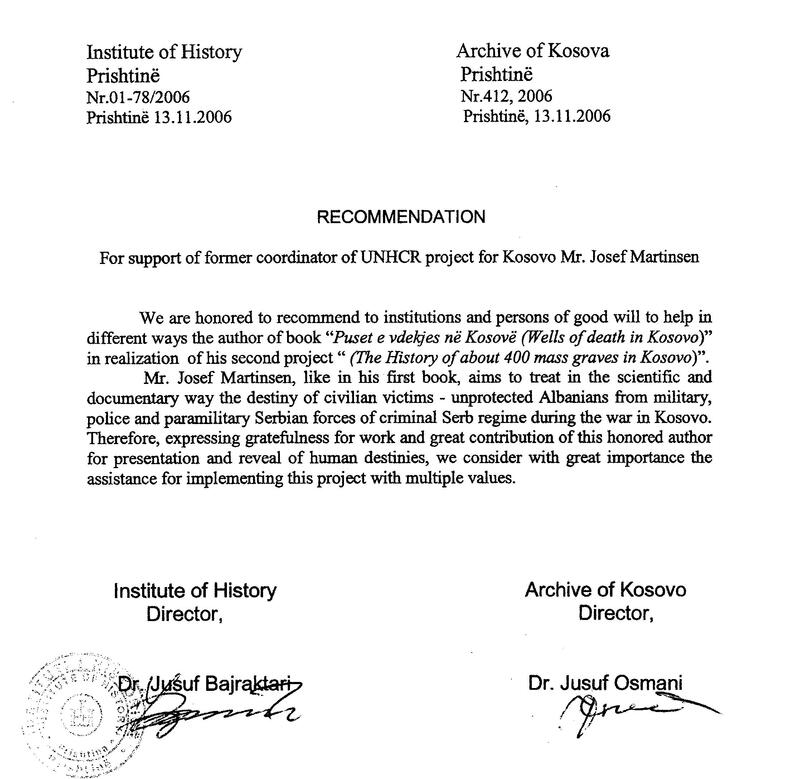 Many leading political officials both in Serbia and abroad view this promotion of a war crime convicted military general as lecturer and teacher for the next generation of officers and soldiers as a mockery of all victims of war crimes committed in Kosovo, their families and the international justice system. You cannot just appoint a former military war criminal to teach today’s youth about the laws and rules of the war, most of all, because he didn’t follow these same laws and rules during his own service and he has not shown any remorse or repented of his grossly criminal behavior. There are many families in Kosovo and Serbia today still waiting for the bodies of their loved ones who were killed in Kosovo during 1998-99 to be discovered. We are talking about approximately 1,669 bodies or remains that have still not been found (400 Serbians and 1,269 Albanians). These families are still suffering because they still cannot put the death of family members or friends behind them since they have no grave to go to. Which elements weigh in when it comes to reconciliation and forgiveness? How can we move on from today’s situation? Current and former activities initiated by the UNMIK, the EULEX and other authorities related to the process of reconciliation have had little if any impact. What are the elements that they seem to have missed? This initiative will focus on these shortcomings, primarily by identifying the essential parts of restoration that can potentially lead to reconciliation and forgiveness. The first element is no doubt the importance of finding the still missing civilian victims, approximately 1669 people, probably buried in mass graves somewhere. The affected families have already been suffering way too long. The second element is the coming forward of perpetrators and possible witnesses to war crimes committed involving those 1669 persons still missing. The soldiers, police officers or others that committed or witnessed war crimes also suffer psychologically and physically from the impact of their actions. The orders given by their military and political leaders at the time led or forced them to commit war crimes. In order to find the remaining victims in Kosovo or Serbia we need cooperation from the soldiers, police officers and paramilitary personnel or civilians who – under order from superior officers and political leaders – committed war crimes. Witnesses of what happened are also in an agonizing situation. Due to the non-disclosure agreement in effect during wartime they have been struggling by themselves with the burden of their involvement. Not having been able to talk about their war experiences can result in psychological and physical strains. You can inform us without being afraid for your identity being disclosed. The third element is the grave suffering of the younger generation in Serbia and Kosovo, because the political establishments in both countries have shown an incompetent leadership dealing with the situation after the war. The losers are the youth in Serbia and Kosovo who face limited access to jobs, travelling and education opportunities either at home or abroad mainly due to the political leaders’ inability to solve conflicts of interest. The younger generation can make a difference by encouraging a discussion on how to solve the problem with the missing war victims. I am convinced that once the missing bodies are located a fundamental cornerstone will be put in place, which could serve as a starting point for upcoming reconciliation and forgiveness talks. PLEASE HELP US TO FIND THE MISSING PEOPLE; IT WILL SERVE YOUR COUNTRY – YOURSELF – YOUR CHILDREN AND GRANDCHILDREN. 2. Serbia’s missing contemporary history 1998-99. Every democratic country striving to improve economically and normal living standard for its people needs an opposition and plurality of views concerning events that take place when it comes to describing actual and historical events. If the current political system subdues expression it doesn’t like, the dynamics of allowing plurality of opinion will be absent and thus result in statements or opinions the validity of which have not been tested. Statements and opinions that have not been tested are worthless in a normal world. Mirko Kovač (1938-2013), a Yugoslavian author who wrote a critical article regarding Milošević’ politics in the magazine “Srpska reč” in May 1992. You will find this article in my second book. Nataša Kandić (1946 – ), a human rights activist, founder and former executive director of the Humanitarian Law Centre in Belgrade from 1992. In 2015 they published Kosovo Memory Book. Sonja Biserko (1948 – ) a former Yugoslavian diplomat for over 20 years, human rights activist from 1991 after resigning from her position as a diplomat at United Nations in Geneva due to Milošević’s policies. Svetlana Đorđević (1958 – ) a former taxi driver in Kosovo Polje, Kosovo between 1995-1999. Based on her diaries she wrote a book called “Svedočanstvo o Kosovu” (2003) ISBN 86-8299-43-0 (Testimony about Kosovo), which was translated into Norwegian under the name “Hell mountain” (2008). Following the book’s publication in Serbia and an interview on B92 she experienced massive harassment also by Serbian police, which in turn made her to seek asylum in Norway in 2004. All these people made a substantial contribution towards enlightening the population but they were branded as traitors. They have not been recognized to this day. In my opinion, their work regarding documentation and political awakening for over 30 years should be part of the curriculum in schools and universities. One thing that strikes me most when I look at this list of names is that women are well represented; they have demonstrated a high degree of civil courage in a turbulent time.